Icklingham is a village in the Forest Heath district of the English county of Suffolk. 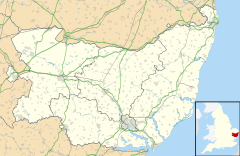 It is about 7 miles (11 km) north-west of Bury St Edmunds, 4 miles (6.4 km) south-east of Mildenhall and 9 miles (14 km) south-west of Thetford in Norfolk. The village is on the A1101 road between Bury St Edmunds and Mildenhall in the north-west of the county. The area around the village, characterised by a sandy gravel-laden soil, is known as Breckland, though an arm of the fen-like peat follows the River Lark past the village. The village straddles the River Lark, a tributary to the Great Ouse. It was once navigable up to Bury St Edmunds, with locks installed; these are now redundant, the remains of at least one lock being visible near Icklingham. The river is the reason for the siting of Icklingham's most prominent industry, the local flour mill. The village church, All Saints Church, Icklingham, is Norman in origin and a Grade I listed building. The village is characterised by flint and pale brick cottages. There were two thriving public houses, including the magnificent thatched Red Lion, in the village, but they both closed. A village shop no longer exists, and the village hall, the former School House, is now in private hands. The village contains 11 Listed Buildings or structures. The village takes its name from an Iron Age tribe, the Iceni, who lived in the area and has the remains of a Roman settlement to the South-East. A Roman Christian graveyard exists in Icklingham, and a lead receptacle, reputed to be a baptismal font was found on the same site. The Icklingham 'font' is made of lead, and is visible in the British Museum. It was also one of the largest Anglo-Saxon settlements in the area and can demonstrate nearby occupation to Neolithic times, through research carried out by Liverpool University over many years. The Black Ditches boundary ditch runs to the south of the village and is believed to be the most easterly of a series of early Anglo-Saxon defensive earthworks built across the Icknield Way. From 1808 to 1814 Icklingham was the site of a station in the shutter telegraph chain which connected the Admiralty in London to its naval ships in the port of Great Yarmouth. It has been said that on a clear day, a message could reach Great Yarmouth from The Admiralty in London, and receive a reply, in little more than 15 minutes. The horse-borne messenger would take three days, at best. Icklingham is within the area known as Breckland, an area of sandy heaths and forests. This area has a number of important natural habitats, including for the protected stone curlew. The village is surrounded by the Breckland Farmland Site of Special Scientific Interest and close to the Breckland Forest SSSI, both of which cover large area of Breckland and are two of the largest SSSI areas in England. The Icknield Way Path passes through the village on its 110-mile journey from Ivinghoe Beacon in Buckinghamshire to Knettishall Heath in Suffolk. The Icknield Way Trail, a multi-user route for walkers, horse riders and off-road cyclists also passes through the village. A number of smaller SSSI areas are found in the Icklingham area. These include Berner's Heath, the largest area of heather heathland in Breckland at 149.6 hectares (369.7 acres), and Deadman's Grave, a grassland heath area of 126.3 hectares (312.1 acres), both of which are north of the village. Cavenham-Icklingham Heaths, to the south-east of the village, is 418.8 hectares (1,034.9 acres) in area and includes a number of woodland habitats. All contain rare species such as Rosser's sac spider (Clubiona rosserae) and the soldier-fly (Odontomyia angulata) as well as stone curlew and plant species such as Breckland wild thyme (Thymus serpyllum) and spring speedwell (Veronica verna). ^ Historic England. "Church of All Saints, Icklingham (1351332)". National Heritage List for England. Retrieved 2013-01-26. ^ Berner's Heath, Icklingham, SSSI citation, Natural England. Retrieved 2013-01-26. ^ a b Deadman's Grave, Icklingham, SSSI citation, Natural England. Retrieved 2013-01-26. ^ a b Cavenham-Icklingham Heaths, SSSI citation, Natural England. Retrieved 2013-01-26. This page was last edited on 17 March 2018, at 08:43 (UTC).